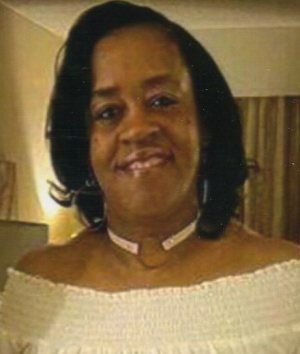 Michelle Renee (Rollins) Eckford departed this life on Wednesday, October 4, 2017. She was born on April 26, 1966 in Fremont, Ohio to Constance (Price-Rollins) Johnson and LeRoy Rollins. She graduated from Fremont Ross High School in 1984. Michelle married Jerardo Commodore Eckford, Jr. on June 3, 2006. Their union was blessed for eleven years, and he survives. Employed at Alkon Corporation for the past twenty years, she made many lasting friendships while being a supervisor. Michelle took great pride in her family and friends. She especially received great joy in loving and spoiling her grandchildren. Whether it was hanging out on the front porch with family or friends, traveling, or just being “Chelle”, she was always the “Life” of the party. Her loving smile touched and brightened every person she came in contact with. Known for not holding back punches, Michelle “Absolutely” spoke her mind! You either listened or if you didn’t, she’d continue until you “Got It”! father-in-law, Howard (Ruby) Eckford of Marks, MS and mother-in-law, Katie Smith of Batesville, MS; Siblings Claudia (Jodie) Price of Cincinnati, OH, Troy and Rachel Rollins of Fremont, OH, Jennifer Rollins of Columbus, OH, and Tangela Lindsay-Gray of Cleveland, OH; brothers-in-law, Marvin Eckford of Marks, MS, Howard (Amber) Eckford of Findlay, OH. and sister-in-law, Marietta Eckford of St. Paul MN; her loving grandchildren Tearney Hardin, Daleon Sloan, Jalayah Liggins, Johnquay Liggins, Jr., and Jasbrielle Liggins. Special friend Laurice Hicks and a host of nieces, nephews, cousins and friends. She was preceded in death by great grandparents, Henry and Idell Sewell; grandparents, Claude and Johnnie Mae Price; and brother Damon Thomas. Visitation: Tuesday from 2-4 pm and 6-8 pm at Wonderly Horvath Hanes Funeral Home and Crematory, 425 E. State St, Fremont, OH. Service: Wednesday, October 11, 2017, 12:00 pm at Greater St. James Church of God in Christ, with one hour of visitation at the church prior to the service, 629 Sixth St, Fremont, with Dr. Pat McKinstry officiating. Memorials: To the family care/of Tiela Jones. I am so sorry for your loss. She is with the Father now and is free. Love and prayers to you all during this time. Condolences to the family, Michelle will be truly missed. I will always love you Michelle…You were a great friend and cousin to me..My condolences to the family. My condolences to Michelle’s family. I pray that God gives you a comfort and peace beyond all understanding. My sincerest condolences to the entire family. I’m so sorry for your loss. She was a very real person and my heart goes out to the family. God has gained a Angel. Feeling very sad for this great loss. I had the pleasure of working with Michelle, and she was a joy to work with, always happy and with a great attitude. Going to work was great when she was there. She will be missed. God gained one beautiful angel. No matter when she seen me or where she would always say to me, “girl when you gonna teach me how to dance like you”. Her smile brighten any room she was in. Rest easy Ms. Michelle. My condolences to the family. Very beautiful person inside and out. Fly high Michelle!! Although no words can really help ease the loss you bear, just know that you are very close in every thought and prayer. You have my deepest sympathies. Nothing that occurs in this life has the power to separate a believer from the love of God. The love of God is so strong, even physical death cannot separate us from His divine love. Death may separate us from the earth and from people we love, but it is impossible for death to separate us from the love of God, for God’s love doesn’t stop with the cessation of life. I was so happy to help you get your home..we always had a good connection. Way back from jonquay being at the daycare at the ymca. You will be missed by many. You always had a big heart. Prayers to the family in this time of healing. Condolences to your family. Our thoughts and prayers to your family and friends. You have our heartfelt condolences Wally and family. God received an Angel this week. Hits my heart soo hard. My last words I spoke to her was telling her how proud I am of her for overcoming her demon. She grinned from ear to ear and thanked me for acknowledging how far she has came. She said “it wasn’t easy, but I made it.” Felt so good to tell her that I’m proud of her after seeing what the demon of addiction can do to someone. Thank you Michelle for giving hope to others that you too can end up on top. Thank you also Michelle for being an example, an inspiration, and a light of hope. You’re smile will forever be impressed on my heart. Love you girly. Rest high, right beside the man who called you home. They say everything happens for a reason, we just never know why. We pray that the Lord wraps his arms around you all so you feel comfort & peace at this trying time. Tanka is loved by many and we reassure you that the football boys, coaches and football moms will be there for him. Michelle was a wonderful person and she will be dearly missed. My condolences to Michelle ‘s family on your loss. We bless you and honor your life on Earth and pray for your peace ever- after. Go well into the Kingdom of Heaven. Please know how very saddened we are at the loss of your beloved Michelle. Greater St James Church sends our deepest condolences to the family. We can’t imagine how painful it is for everyone, but please know that we will always be there in prayer and with any other support needed. Having lost someone is a difficult moment of life. May God provide you the strength you need to cope with this difficult situation. We send are condolences to Gma Connie, Wally and the children. The world is less bright without Auntie Chelle in it. Her hugs, her smiles, her laughter were all infectious. She was wise too and i akways listened to her. I should have called or contacted her more in the last three years. My dear friend I’m going to miss you so much my heart is so heavy right now. Not only was you one of my best friends but also a second mother to me and the god mother to my children. We had so many future plans together ❤ My heart hurts so bad for your children that I know you loved with all of your heart and soul. Life will never be the same without you Michelle I’m blessed to have shared so many years with you right by myside. Prayers and fond memories are what we have to remember our dearly departed cousin. My most heartfelt condolences. I am here. I can never die. Just as I accept sleep, I accept death. The peace and freedom are what I seek when I rest, not waking up. Ordinarily, I look at death with deep sadness and dread. However, those that have gone before me let me know of its wondrous freedom and peace. Just as the wave goes out to sea and returns as a wave, so does my going out to death return as eternal life. I am a wave…please fortify my heart and belief as I watch waves depart and give me patience, understanding, and peace until my wave departs. Thank you for all of the great happy feelings. Rest in peace and freedom. I am not able to stop shaking my head in disbelief; Wondering what is the lesson, what is the word word of wisdom and who is supposed to listen? I am listening Michelle! ” Be ready, be real.” How is the only question that keeps running through my mind; how will they go on in the next days weeks and years; How……. I hear no answer to that; no opinion other that…….YOU MUST. God wrap your arms around these children, this husband, these grand babies, these siblings, these parents, these best friends. How do we go on? “YOU MUST” I HEAR YOU CHELLE!